The CacheSYSTEM® 7000 Series provides the ultimate level of cash control by limiting cash exposure and providing seamless accounting between the POS and your bank. It offers the combined benefits of cash-counting and bill validation with change-fund management and an audit trail of all transactions. Count and Validate Funds: Each safe is equipped with casino-quality bill validators that provide the highest level of first-time bill acceptance and unsurpassed counterfeit detection. Counted funds are secured in cassettes for easy transport and deposit. This series may be fitted with up to four validators. Dispense Change: Our vending magazine is simple to load and count. The inner view provides a visual count of inventory, eliminating reliance on a dipstick. 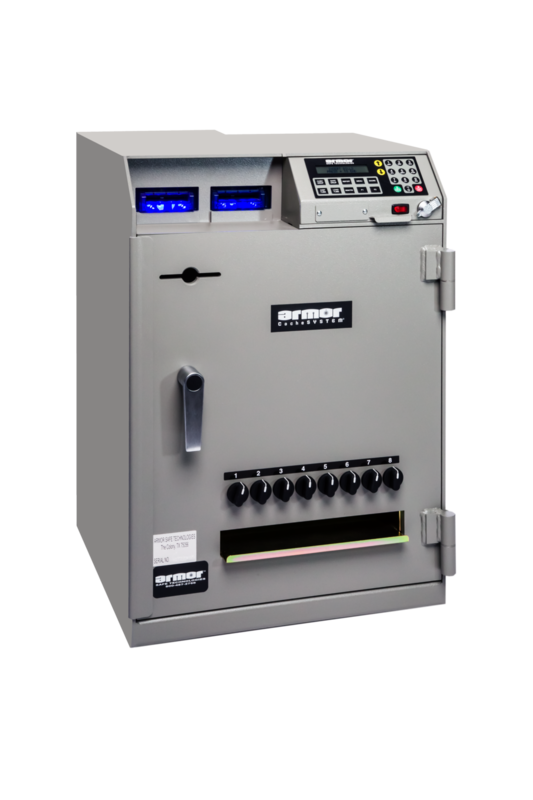 Note: If you're satisfied with your existing solution for your change fund but still would like an Armor safe that can help you manage your cash deposits, please see our CacheSYSTEM 2400 Series safes.